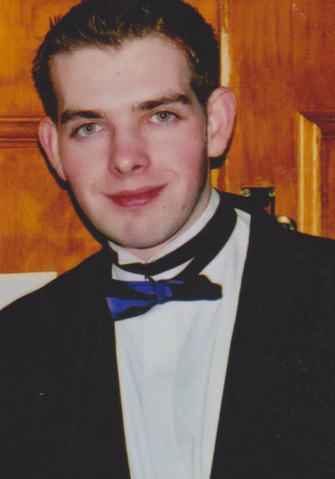 DERRY man Bobby Bradley’s son Robert died in a car accident in Nottingham in December 2000. He was just 20-years-old and studying broadcast journalism at Nottingham Trent University. A drunk driver drove down a one-way street at speed, mounted the kerb and crashed into Robert. He was thrown into the air and impaled on railings. His friend Alexandra Veeder (21), from Manchester, suffered multiple injuries and died in hospital. The driver was later jailed. Bobby and his wife Anne were told of their son's death at a Dublin hospital where they were visiting another son Thomas who had been injured in a car accident in Dublin 10 days earlier. Bobby said Robert’s death has had “a totally devastating impact” on his family. “My wife has never been the same person. It just devastated her life. He is still angry with the driver. “He had so much alcohol in his system. It was just a time bomb. He has never shown any remorse or made contact. But you just have to really put him out of your life and get on with life. It's not easy, but that's the way it is and we have to live with it. “I always feel sorry when I hear of a road accident because I know what that family's going to have to go through at the time and for the rest of their life. Constable Jayne Parkes has the unenviable task of telling families they have lost someone in a fatal road accident. She is one of the PSNI’s family liaison officers. “When there's a fatal road accident I get deployed. One of my first roles is unfortunately to break the news to the family that they have lost a loved one, be it a son or a daughter,” she said. “I tell people very straight. Unfortunately that's the way you have to do it. Some people burst into tears immediately. Others just sit in shock. “This is a world that most families have never been in so in the shock and grief of it all they need somebody like myself to basically carry the family through to where they need to go in the first few days and all the way to the end of the experience, be that at a trial or an inquest. “I work with the investigation team and help the family as we prepare for a trial, if that's what's called for. I'll go to the court with them. I'll sit with them as the trial goes on, and then after that I'll attend the inquest with them. So I can be working with my wee families for years. “The hardest part of my job is whenever I take mummies and daddies up to the Royal (Victoria Hospital) to identify their children. I have a family, like we all have families, and I have to take them up knowing that the last time that they saw their wee girl, that she was going to work and now she's lying in the mortuary. Jayne urged drivers to drive “as slow as you need to, not as quick as you can get away with”. Cruse Bereavement Care Northern Ireland offers support, advice and information to children, young people and adults. Paul Finnegan from Cruse said that sudden or traumatic death can be particularly hard to accept. “In anticipated death circumstances, you often have the opportunity to say all the things you wanted to say. However in sudden death circumstances you don’t have that opportunity. That leaves a terrible void with things that were left unsaid or undone. “In sudden death there is an added step in the coping phase of grief which is helping a person to let go of the fact that they did not have the opportunity to say goodbye. “Additionally, the traumatic nature of the sudden death can deliver strong emotional and physical symptoms. These symptoms can vary from screaming to shaking, to an inability to talk or move, or eat, drink or sleep. Forgetfulness is commonplace and there is often a sense of time standing still. Physical responses may include general symptoms such as headaches, diarrhoea, vomiting, stuttering, heart palpitations, jumpiness, and exhaustion. Paul said it is important for people bereaved by sudden death to take care of themselves. •There is guidance on the Cruse website www.cruse.org.uk for people who have been bereaved through sudden death. The helpline number is 0844 477 9400 or email [email protected] To find out details of local area support offices across Northern Ireland, call the regional office on 02890 792419.